Kale is certainly a vegetable that divides us all. I am certainly in the pro kale camp but I am sure there are many of you out there who are already tuning out because you really do not like kale. I get that it’s leaves are sturdy and therefore take rather more chewing than, say, Savoy or white cabbage. But let me persuade you that eating kale can be a pleasurable experience with my latest dish. 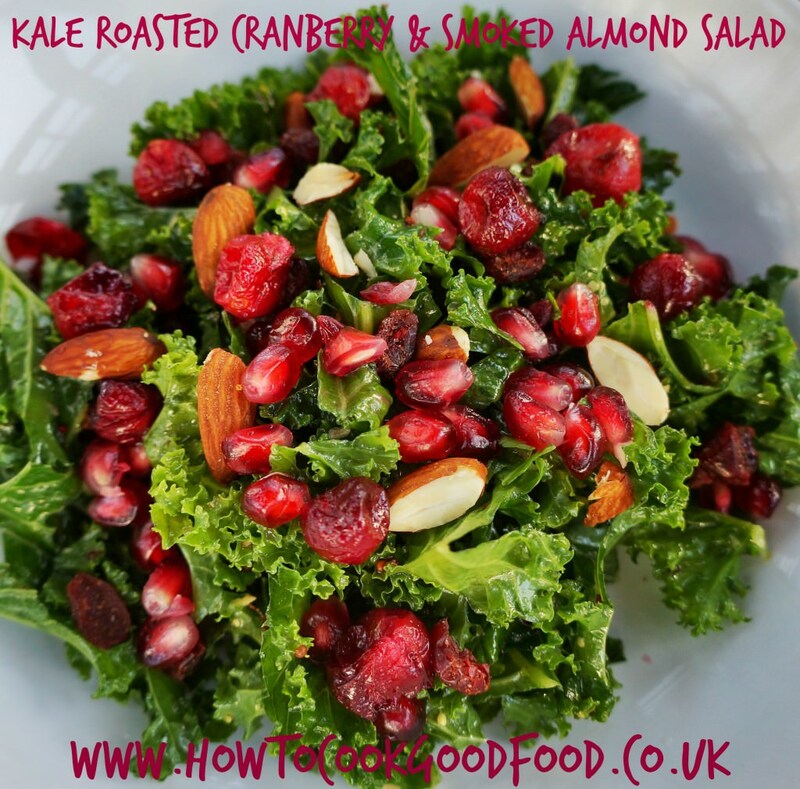 How does a kale, roasted cranberry and smoked almond salad sound? These ingredients along with a few dried cranberries and a scattering of crunchy pomegranate seeds make this an absolute winner of a winter salad. My recipe came about from two things. ONE. I needed to use up last year’s store of frozen cranberries. I thought, why don’t I try and roast them and see what happens? I adapted THIS recipe and it was a revelation. You have to try roasted cranberries of you love sharp almost bittersweet flavours as I do. TWO. Smoked almonds that were sent to me along with a festive hamper from John Lewis. The rest of the hamper will be going to the school fair but I just had to have those almonds. They taste exactly like smokey bacon and provide a meaty note to the salad as well as crunch. This would make a perfect accompaniment to any festive meal but I am largely thinking how well it would go with all the Christmas leftovers. So instead of making the regular leftover bagged salad plus under-ripe tomatoes and soggy cucumber, make this instead! 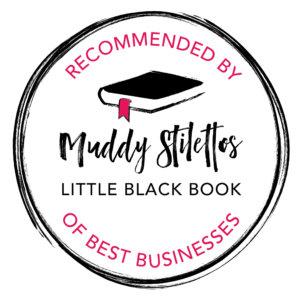 If you are in need of any further hamper inspiration for Christmas gifts this year, you might want to take a look HERE. Thanks to John Lewis for providing me with a festive gift hamper. I was not required to write a positive review. All opinions expressed are my own. A super salad to enjoy in winter. Mix all the ingredients together in a bowl and whisk together. Alternatively place them into a jam jar and shake well. 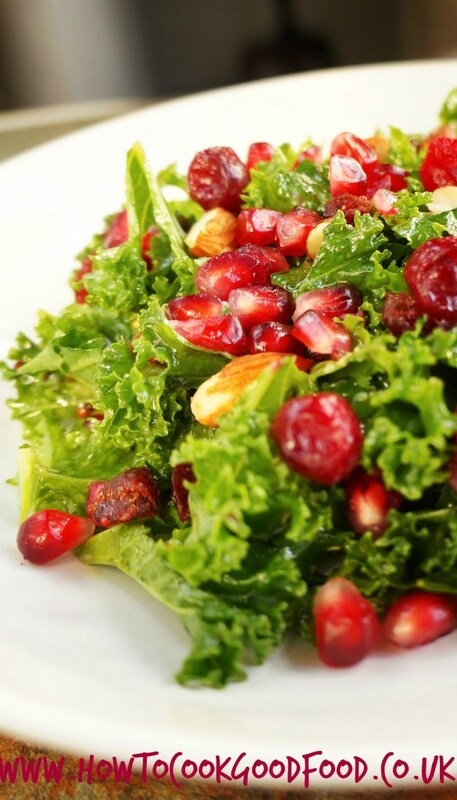 Place the kale leaves into two salad serving bowls and top with the roasted cranberries, dried cranberries, almonds and pomegranates. This is a wonderful salad. You are right Kale has quite a tough leaf and you need to know how to prepare it. The addition of cranberries gives this salad a Christmassy touch. Beautiful. It is definitely a very festive salad Alida! It does make a great lunch Camilla! Smoked almonds sound perfect and I bet they go really well with the cranberries. 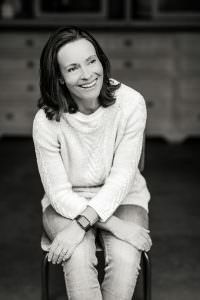 It all sounds so good Laura – and it must be pretty healthy too. The colours and the contrasting textures would make this a really interesting salad. Absolutely stunning! Love the little red pearls, so beautiful and so festive! Thanks Becca, I love test colours too. So festive but also tasty! I haven’t tried roasting cranberries but I LOVE their slightly sharp flavour – and need no excuse to put them in a salad. Lovely recipe (kale fan). 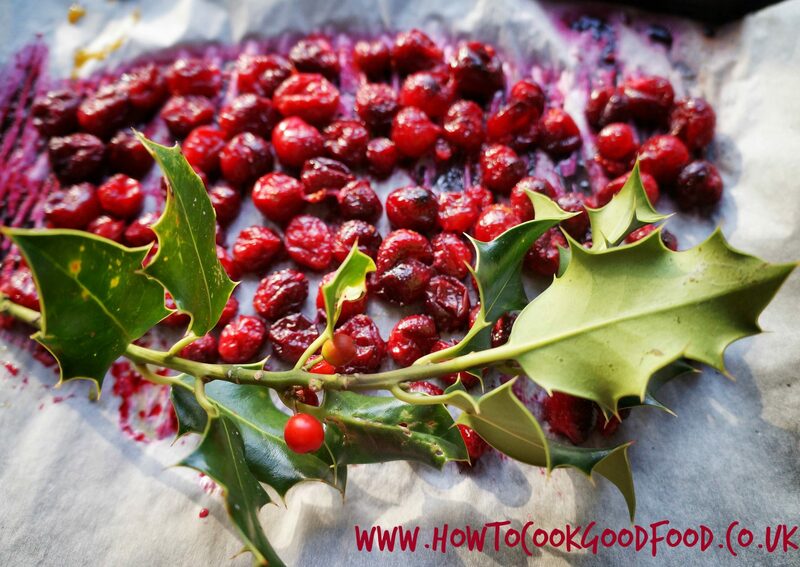 Roasting cranberries is such a great discovery Sally, I will be using them loads this year! A beautifully festive looking salad Laura – thanks so much for joining us for Simple and in Season this month. gorgeous recipe Laura – not thought of putting cranberries into a salad. so pretty . 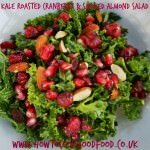 I am using Kale a lot at moment – nice that it lasts a little longer than salad leaves! I adore kale and this is surely one festive way to dress it up. Thanks for sharing with NCR. I’ve not seen anything like it before and your winter salad really excites me flavour wise and visually. 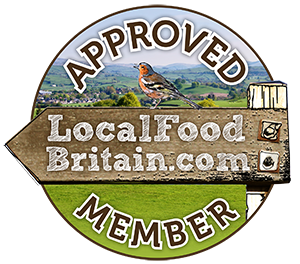 Thank yo so much for sharing with EatYourGreens, its really appreciated. Thanks Shaheen, it makes a welcome winter salad, pleased you like it! This has to be the most festive looking salad I’ve seen yet! And sounds delicious, I adore smoked almonds and I can imagine they really do had a tasty punch to this salad. Plus I am a kale lover, just wish I could get my kids to appreciate it! 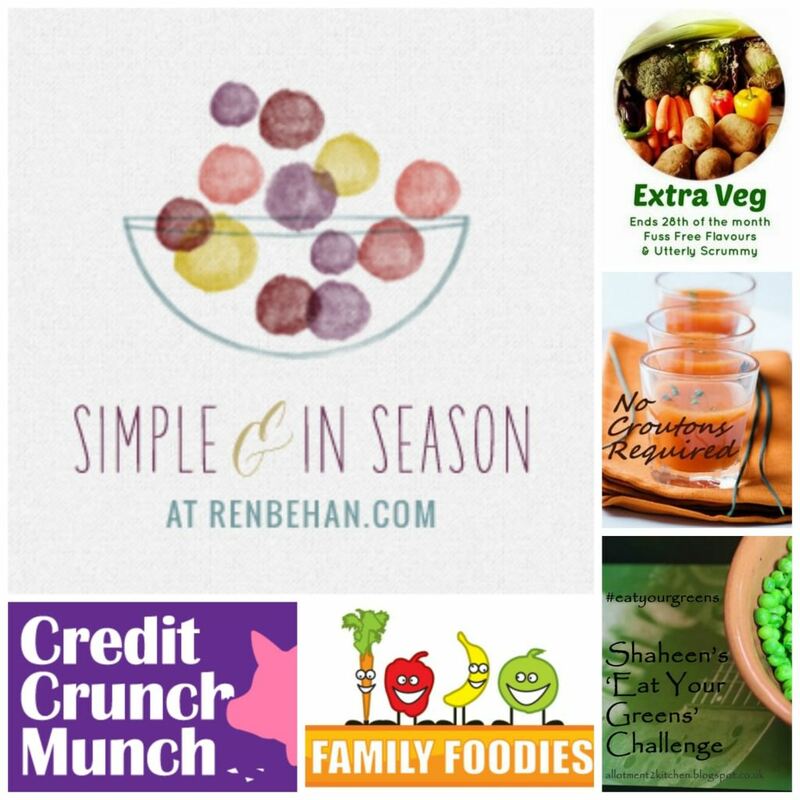 Thanks so much for linking up to November’s Family Foodies Vegetarian event.